Trinity Sunday. Every preacher's favourite moment. All I need to do is find words to describe the indescribable without lapsing into heresy. This is a great YouTube clip. I like its sly look at the usual illustrations and it's assessment of their failures, but its final work through what the Trinity is leaves me baffled. So instead, I'm returning to an idea that dear Gill Tuck in Pontypridd put in my head a few years back. I don't remember whether she said this, or whether her sermon simply gave me the idea, but I'm crediting her with it because her Trinity Sunday sermon remains the best I've ever heard. This is a time to look at the big picture of God. The whole picture of God. So often we focus on details, on moments, on ideas, on facets of God through the Scriptures. This Sunday asks us to stand well back and for a moment dare to take in the whole view. I don't know about you, but when I see a great painting, often I focus on a detail. 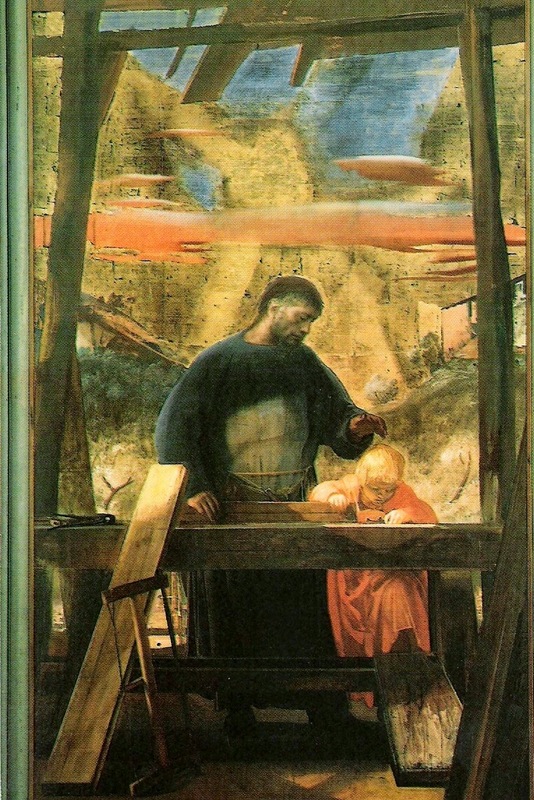 Annigoni's St Joseph in San Lorenzo, Florence, is one of my favourite paintings. I'm drawn initially to the light embracing Joseph from above, wing-like, radiant. The Spirit empowers the scene, gives it grace and movement, but the light carries through to the wooden plank resting on the table, and hints upward into the sky, and suddenly that embrace is a cross. Light and dark, glory and pain. Spirit and desolation. Then I see Jesus, the child in the workshop. I've never noticed his face. I've never objected to his fair hair, which I hardly see. All I see are the nails in his hands. He plays with nails on his father's bench. Long, cruel, carpenter's nails. A child, just a child, with no idea what they will mean. Or does he know? Does he feel it? Is his innocence touched with understanding? And Joseph. The father who is not the father looking at the son who is not his son. His face I see every time. Pain and sadness and love and pride and blessing, and a hand that would stop what the child is doing (nails in the hands) and will not stop, cannot stop. The son will choose. The father will love. And then, when I'm in San Lorenzo, and sitting in that beautiful building in front of this immense canvas, I forget the detail and let the whole work overwhelm me. It's too much. I am numb with awe. I have no words anymore. Tears replace them. This morning, the Wednesday Congregation asked for Isaiah 40.12-17, 27-31. I know, I know, but that's what the lectionary does - bleeding chunks. So I started with a reference to... looking at the whole of God, which is a big ask. But if all we see is the bigness of God (vv12-17) we haven't seen the whole of God, for in vv 27-31 we find the Creator who touches the weak and gives them strength. The transcendent God who becomes immanent. Which are big theological words for the Mothers Union: so I found myself retranslating and, on the hoof, describing the pleasure, the wonder and the paradox of these verses as "the God who is really huge is also the God who is really here". And then he was. In the silence, in the awe, in the midst of those dear, dear people with all they face, we waited upon him and felt ourselves soar awhile. Holy, holy, holy. Sometimes I think it's more a response to seeing God than a description.